Christ school of law is part of the Christ University, Bangalore. The motto of this institution is excellence in education and service to humanity. Christ University school of law is one of the top ten law colleges in India in 2018 according to the rankings of " The Week" magazine. Earlier, until last year the college was placed on rank 12 among all Indian law colleges. Also, the college is rated A+ by NAAC and UGC. The current total intake is 700 students in the batch comprising of both BA.LLB and BBA.LLB seats. This article will talk about the exam pattern of the Christ law entrance exam 2018 which is going to be held on April 29, 2018. 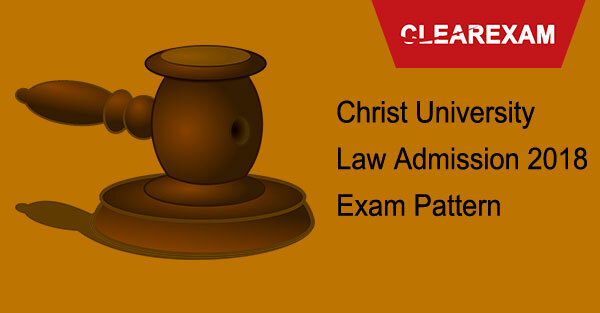 Let us begin talking about the Christ law entrance exam pattern with what is going to be the format of the exam. This exam is going to take place in the offline format or what is called the pen and paper mode. According to the Christ law 2018 pattern, the total duration of the paper is 2 hours or 120 minutes. The Christ law exam paper pattern states that the whole paper would comprise of 120 questions which like stated above will have to solved in 120 minutes. All questions will be in the objective format. Each question will have four options and the student has to mark the correct choice. The Christ law exam pattern 2018 states that the total marks of the paper are also 120. This implies that each correct answer adds one mark to the score of the student, and negative marking is applicable and 0.25 mark is deducted for all wrong answers. The below table illustrates what are the sections that are covered in the paper, total number of questions in each section and marks for each section. There is another step in the process of selection which is called the skill assessment test which comprises of a test of written skills, communication skills and logical reasoning. The selection process also includes a micro presentation of 90 seconds duration. Here the students will be asked to speak about a topic for 90 seconds. The topics will be announced in January 2018. Also, CULEE aspirants would be asked to appear for a personal interview. This will of a duration of maximum 15 minutes. Last of all the student's past academic performance would be taken into account. The marks of grade X, XI and grade XII ( if announced ) would be considered. The entire selection process takes place within 5 days of the entrance exam called CULEE. Christ school of law is a good choice of a law school and regularly wins many laurels at both national and international level in events such as model UN, moot courts, drama, music and also in the field of research and seminars. The college is Bar council approved, and is an authority in the field of constitutional law, IPR and trade law, administrative law, commercial law and corporate law. Christ University will release CULEE Exam Pattern for CULEE 2018. Read the post to know CULEE 2018 Paper Pattern.